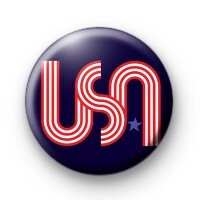 Cool USA Badge in blue with the USA written in a red and white pinstripe style font. Also features a small blue/purple star. These badges are popular with our American customers & many pin them to luggage and backpacks when travelling. Also perfect for American sports teams & clubs. If you have a USA themed even or party, these also make a great addition. 25mm (1 inch) button badge made by hand in our workshop. We are a small family run business & we post our badges to countries all over the world. We offer free delivery on larger orders, regardless of country. We can also offer Next Day delivery for orders in the UK.